Last Thursday we had a blizzard. It wasn’t unlike the New Jersey snow storms we are used to, except for the temperature; it was in the high 30’s, and the wind. 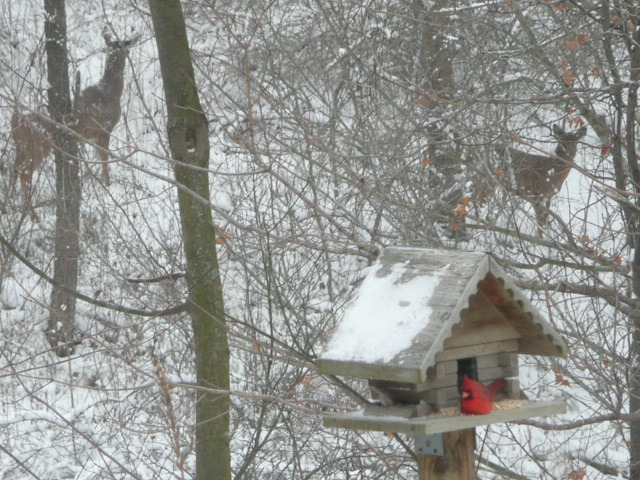 We had good intentions about getting things done in the house, but truth be told, we ended up drinking two pots of coffee while chewing the fat, sitting at the kitchen table, watching the birds and the deer and photographing them . I can waste more time here. And, I am slowly losing the guilt usually associated with doing nothing. Boy, that didn’t take long, did it? We’ve only been here for two months. My usual need to be engaged continuously has also gone by the wayside. Slowly, I am becoming a hermit. In some ways, hermitage is a good place to be. It allows you to introspect. I am the easiest person to persuade to do something. You want to knit a certain garment? I’m game. Just suggest a workshop and I’ll take it. This trait often turns on me. I’ll end up hating the project and torture myself finishing it, or worse, spend a small fortune on a workshop and leave before it’s over. I have done that more than once this year. One of the lessons I am learning in solitude is that I already know how to do all of the stuff I need. I can dye until the cows come home, and I like the way I do it. A few years back, I drove all the way to coastal Mass. to take a dye workshop at Prochemical, and most of the time I was there, I kept questioning my motives. I left after completing the three-day $300+ workshop and braving the Connecticut Turnpike for seven hours, only to remember on the way home that Woolbearers had the exact same workshop, taught by Bettes Silver Schack, the first year we opened. There is truly nothing new under the sun. On Friday, members of Blue Coast Artists are coming here to take a look at my studio. They’ve already seen my slides and think I would be a good fit, but want to see where I work. They are a co-op of potters, painters, jewelry makers, print makers, but they don’t have a fiber person, until now! I am so thrilled about this. They offer studio tours for the public during the tourist season here, which runs roughly from end of April until October. I can choose the hours I will be open. Go to http://www.bluecoastartists.com to learn more. Soon, I will have a link and picture there. I named my new business Lakeshore Textiles. Go to http://www.lakeshoretextiles.wordpress.com to see my blog. It doesn’t say much yet, but soon, it’ll list the classes and events I plan on having. It has a Facebook page, …again, Lakeshore Textiles. The sheep have a new home, too. When we first moved in, we had just two days to figure out where they would go. Jim cordoned off a section of the big barn where my dye studio will go. Then he fenced in a small area off the barn for them. They were cozy there, but it wasn’t enough grass for them and the barn was for me, not sheep. We had a small run in shed built for them but it is enclosed with a door. We have coyote here and want to be able to lock the girls in if need be. We also had two acres fenced for them. They weren’t too thrilled with another move, at first. But now they love it. Their house is right in our front yard so we can see them from the picture window in the living room. It used to be that nothing happened as fast as I wanted it to. Now, I feel like I am content to let things unfold as they will and not force anything. A good example of this is when I applied for a ‘Home Occupation Permit’. Yes, you must have a permit if you work from home. I’m not sure how they find out if people are doing this, but I wasn’t about to take any chances since I’ll be advertising, and Blue Coast Artists brochures are distributed in the Township office. I found the municipal code for the township online and could anticipate everything they could possibly want. But what happens when you are prepared is your information is ignored. I got several phone messages that something else was needed, so once I figured out the problem, I got out my thesaurus and kept rewording everything. That worked, and today I got my permit! So, we are slowly, slowly acclimating. I am lonelier than hell, missing my NJ friends, my kids, even my mom and sisters because they are just far enough away to make visiting them difficult when the weather is bad. I have many opportunities to socialize with a great bunch of people, thanks to Ravelry. That may be enough to keep from too much isolation. My daughter, Jeni was here two weeks ago. When we were walking around town, I had to keep reminding myself that I wasn’t visiting this neat place with her as I was last year. I LIVE here! We went into the coolest shop called the Spice Merchant, and I had to choke back tears when I told the guy who owns it how lucky I felt that I could come in their every week if I wanted to. Some of the signs around the area were there when my grandmother was alive and I remember them from my childhood; Saugatuck, Artist Colony; Welcome to Fennville, Michigan, Gateway to the Allegan Forest; The Butler Hotel. Just typing them out brings out the melancholy. Did I think by moving here I would resurrect my grandmother or my father? You can never go back. But I will make new memories here with Jim. Jeni loved it when she visited, reinforcing my original gut feeling that this was the best thing for us. Congratulations on your new venture. I’m so happy for you and Jim. This move has seemed right for you from the start – who else has sold their home so quickly in this market!!? I’m certain you priced it fairly, so I wouldn’t attribute it totally to luck, but I cannot tell how wonderful it is to hear you sound so happy. I know what you mean about workshops. That’s why Jean and Mary and I have been doing so much with our small groups. Not that there aren’t wonderful teachers around or that I know so much, but we do know enough to have fun with it all and isn’t that the main point? Love the piture. Hate the snow. I’m happy for you,Suze. Before you know it you will be surrounded by new friends. Be sure to remind me of this after we move. I am nervous but in a strange way excited to explore new places and make new friends. I remember taking that dye class at the shop. Heidi and I were the “blonde” table.